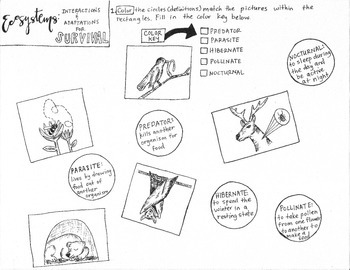 I made this coloring sheet to demonstrate that organisms perform different actions for the ultimate goal of survival. The examples that appear in the coloring sheet are hibernation, parasitism, pollination, nocturnal behavior, and a predator/prey relationship. There are definitions that match up with the visual of the action. Each pair must be colored the same color.